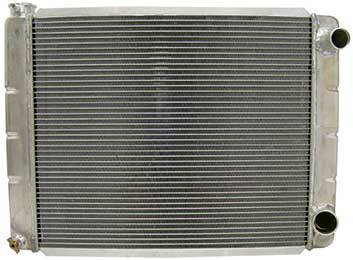 A high performance aluminum radiator is the foundation for providing a cooling system capable of cooling modern racing engines. 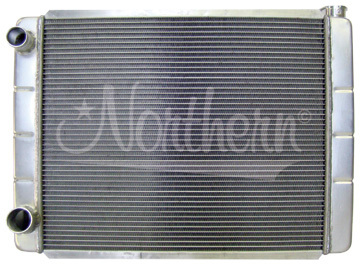 Performance and racing engines generate more heat, often in a shorter period of time, than standard engines do. 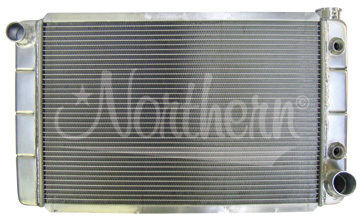 A high performance radiator can help control the high cooling demands of a performance enigne.When it comes to high performance or racing radiators, an aluminum radiator provides the best all around performance. 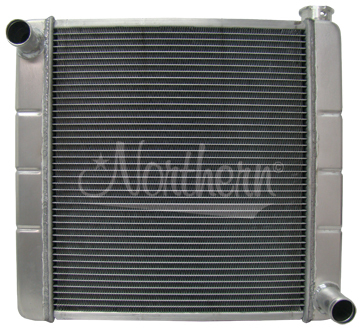 Maximum sustained horsepower levels and durability require an aluminum radiator as a key component of the cooling system. 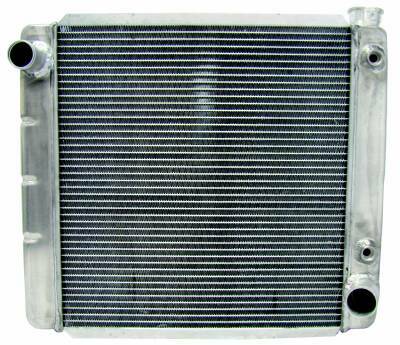 In any liquid cooled internal combustion engine application the use of an aluminum racing radiator allows not only maximum power to be generated, but also for the engine temperature to be maintained in the range required for the highest horsepower levels. 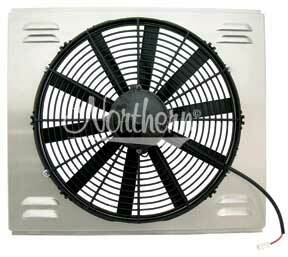 Cooling system requirements vary greatly. A high performance street car, that is also driven to work, has a much different requirement from a drag race only vehicle that is at maximum load for a short period of time. 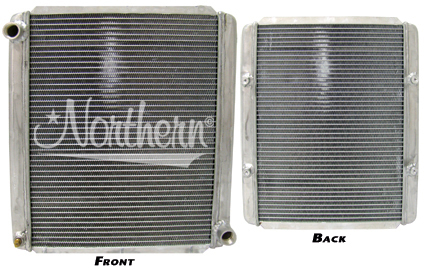 There are many times when an aluminum racing radiator is the right choice, even for a high performance or street / strip vehicle. 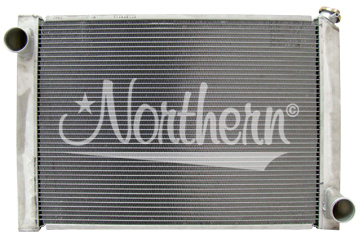 Available here you will find information and great prices on the best aluminum radiator models made by Northern Racing Radiators.We sell high performance racing aluminum radiator models to fit a wide range of needs. 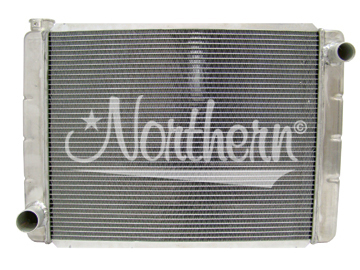 We have light weight VW radiator models, light weight drag racing radiators, radiators with and without engine oil coolers, heavy duty racing radiators suitable for street use, oval track, road racing, off road trucks, ultra light drag racing radiators and even racing radiators for alcohol burning engines. 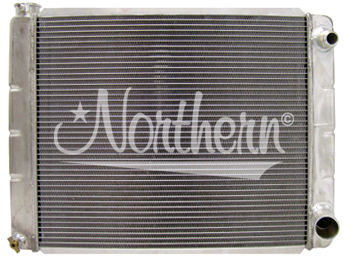 Northern racing radiators use epoxy free construction - nothing to crack, chip or leak! 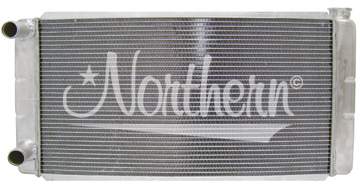 NOTE:The picture in the top section of each table, shows the design of the radiators listed in that table. 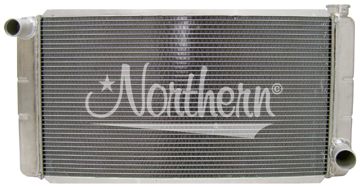 The dimensions of the raditors will be different, as noted in the dimensions, but the layout of the inlet and outlet locations as well ad the radiator cap filler location and oil cooler fittings, if included, will be as shown in the picture. 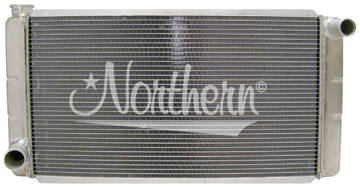 You can click on the radiator picture to see a larger picture which will open in a new browser window. 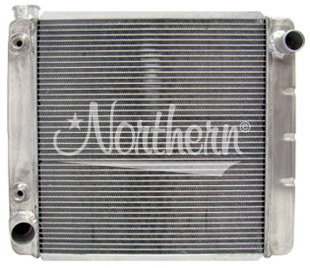 Lightweight design specially designed for alcohol circle track race engines. 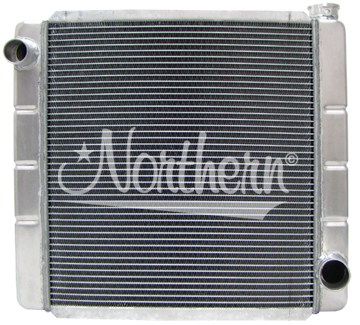 Inlet is 1 1/2" and the Outlet is 1 3/4"
Front of radiator inlet is 3/4" NPT and the Outlet is 3/4" NPT Back of radiator has 1/4" - 20 mounting boss (4). 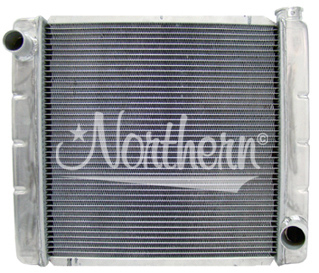 Drag racing radiator has 2 Rows, 1" Tubes Inlet Dual neck is 1 5/16" - 1 1/2" and the Outlet is 1 1/2"
We hope that you found the high performance aluminum radiator or racing radiator that you need on this page. 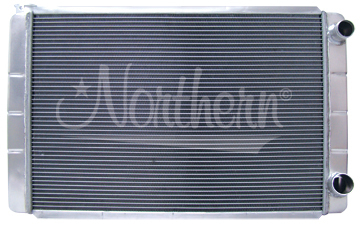 If you did not find a performance radiator with the specifications you require, please contact us and we will be happy to assist you.